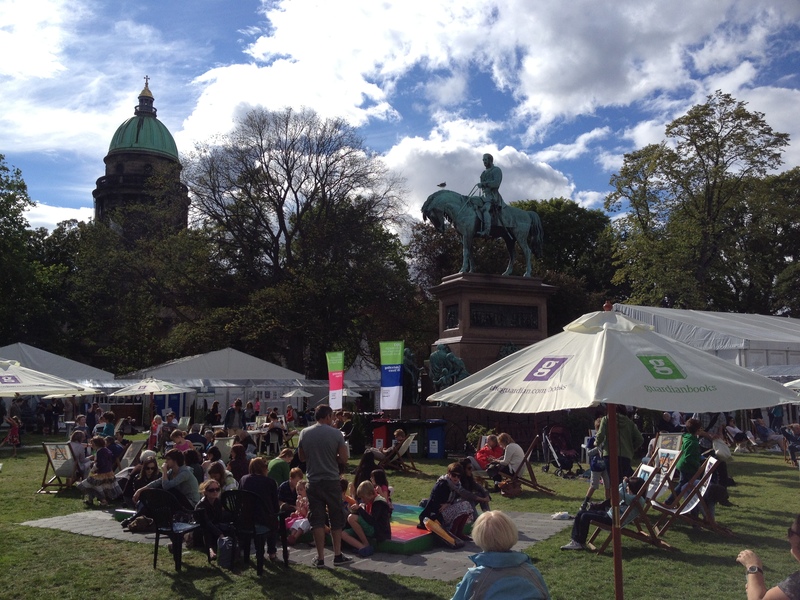 The yearly Edinburgh International Book Festival at Charlotte Square Gardens is the largest of its kind and offers a range of events, readings of prose and poetry, translation duels and events for children. LENDING A VOICE: Translated Literature and Migration. Editor Rebecca DeWald experienced the joy literary translators gain from their profession, and witnessed discussions on the purpose translation serves in the literary world and beyond. TRAVELOGUE WITH A TRAVELOGUE OF TRAVELOGUES – Outriders. In 2017, the EIBF paired five Scottish writers with American authors and sent them on journeys through the Americas. The result revealed “connections between unlikely sources” and is pertinent since “writers and artists’ representing of the world leads ultimately to better understanding and to empathy.” Editor Rebecca DeWald muses on the Outriders series, on travelling, Borges, Argentine women’s writing, the North/South divide in the US and books, books, books. A SYMPATHISING EYE ON TRANSLATION – The Man Booker International Award. Like every year, editor Rebecca DeWald went to a number of translation events at the EIBF. This year she noticed a shift towards more visibility for translation, even though they did not always make the headlines. The event muses on events with Man Book International Prize authors and translators, and poet-translators from the Edwin Morgan Trust. AN INTERVIEW WITH EVER DUNDAS – by Lisa Guidarini. In the run up to Ever Dundas’ appearance at the Edinburgh International Book Festival 2017, Lisa Guidarini interviewed the debut novelist, who is shortlisted for the First Book Award, about her first novel Goblin and her work in progress. THE SORROWS OF MEXICO: Diego Enrique Osorno, Sergio González Rodríguez and Emiliano Ruiz Parra – A thought-provoking evening with eye-witness accounts of the current state of Mexico and its governments war on drugs, as well as other sorrows with which the country struggles – by Rebecca DeWald. MARINA WARNER AND KIRSTY LOGAN – An evening discussing and listening to fairy tales, old and new, chaired by Charlotte Higgins – by Naomi Richards. CELEBRATING SIMENON – ‘Ceci n’est pas une pipe’; An evening with John Simenon, son of the Belgian noir writer famous for his Inspector Maigret novels, but whose romans durs are not to be under-estimated either. Chaired by Daniel Hahn in celebration of the newly issued translations of most of Simenon’s novels by Penguin – by Graeme Macrae Burnet. ALEXANDER KLUGE – ‘Money Rules the World’; A review of Alexander Kluge’s most recent film Grapes of Trust and the estrangement of New German Cinema – by Lin Li. THE MOTH – An evening of enchanting amateur storytelling with US writer George Dawes Green’s collective ‘The Moth’ – by Defne Çizakça. BILLY COLLINS – ‘Just a Regular Fellow’; On twice U.S. Poet Laureate Billy Collins who read from his most recent collection Aimless Love: New and Selected Poems (Picador 2013) – by Stephanie Green. ALEXANDER HUTCHISON AND DAVID HARSENT – ‘Fiery Moons’; On Scotland’s best kept poetic secret, Alexander Hutchison and his new collection Bones & Breath (Salt, 2013) and David Harsent’s notoriously dark “fictions” from his new collection Fire Songs (Faber and Faber, 2014) – by William Bonar. KATE TOUGH – Tough read from her debut novel and makes a walk home from the cancer clinic both hilarious and heartbreaking – by Karyn Dougan. MICHAEL LONGLEY – ‘War, Ice-Cream and Wild Flowers’; Longley reads from his new collection, his tenth, The Stairwell (Cape, 2014), interspersed by others from A Hundred Doors, The Weather in Japan (Cape, 2000) and Snow Water (Cape, 2004) – by William Bonar. DONAL McLAUGHLIN AND ANDRÉS NEUMAN – Two seemingly unlikely writers talk about translation, voice and rhythm, belonging and short fiction through their latest publications, McLaughlin’s short story collection Beheading the Virgin Mary, and Other Stories (University Press Group, 2014) and Neuman’s short novel Talking to Ourselves (Pushkin Press, 2014) – by Rebecca DeWald. PAUL FARLEY AND ROBERT CRAWFORD – ‘Cool Licks and Politics’; each poet showcased a new book. Farley read mainly from his Selected Poems (Picador, 2014); while Crawford aired his latest collection, Testament (Cape, 2014) – by William Bonar. JACKIE KAY – ‘Inside a Woman’s Mind’; Jackie Kay reads from her short story collection Reality, Reality (Picador, 2012) poetry collection Fiere (Picador, 2011) – by Stephanie Green. DOROTHEA SMARTT, A. A. GRAHAM, SASENARINE PERSAUD, and MALIKA BOOKER – ‘Sweet Potato and Callaloo’ brought Commonwealth poets together (collected in the book Yonder Awa and launched as part of the Empire Cafe) to read and talk through the legacies of the Empire and it’s slave trade – by Stephanie Green. CAROL ANN DUFFY – The Poet Laureate on the occasion of the exhibition “Poetry for the Palace: Poet Laureate’s from Dryden to Duffy” at the Queen’s Gallery at Holyroodhouse. Accompanied by musician John Sampson – by Michael O’Brien. ROWAN WILLIAMS – Launch of Williams’ new collection The Other Mountain (Carcanet) – by Samuel Tongue. XIAOLU GUO – Preview of Guo reading from her new novel I Am China – by Rebecca DeWald. MORE THAN AN APPENDIX – Translation Duels in French and Spanish – by Rebecca DeWald. LOYAL TO THE SPIRIT OF TRANSGRESSION – Patricio Pron and Eugen Ruge – by Rebecca DeWald. PERCEPTIONS, PREOCCUPATIONS, PREJUDICES – Jerry Brotton on Maps – by Rebecca DeWald. RACHEL KUSHNER – by Mark West. NO UNDERTAKERS OF THE MULTIPLICITY OF LANGUAGE – Pedro Lenz and Donal McLaughlin on Naw much of a talker – by Rebecca DeWald. MEG WOLITZER – by Mark West.